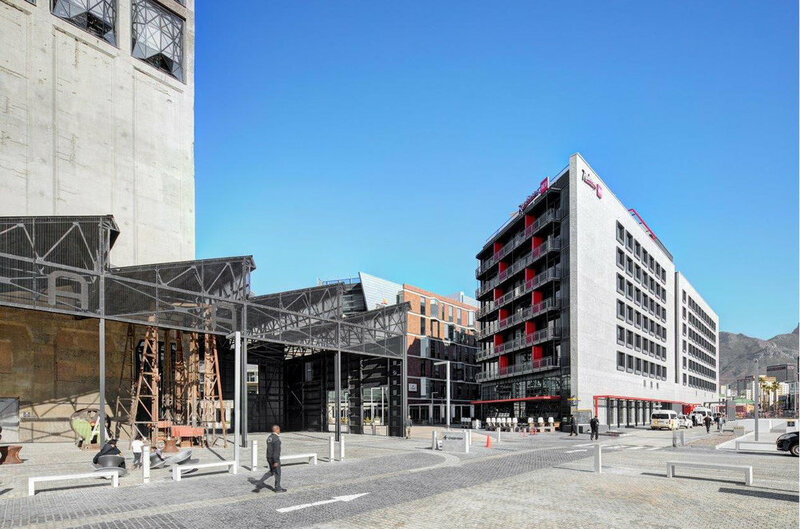 The Radisson Red Hotel is located in the Silo District of the V&A Waterfront in Cape Town. It was completed in September 2017 and is the newest brand of the Radisson Hotel Group. The Cape Town Red Hotel was the first to be built on the African Continent, the fourth in the world, and the largest of them all with 252 Rooms. The Hotel brief for the 7-storey building included a vibrant ground floor with the Restaurant, Deli and bar area opening to the public realm, with conference and meeting areas. The kitchen area and back of house areas are located on the first floor and the bedrooms on the 6 floors above. The rooftop accommodates a restaurant, Van Rouge Bar and pool deck, including plant area. 360* views have been achieved from the rooftop, with the City and Table Mountain providing a backdrop. The No. 6 Silo site is adjacent to the newly refurbished Grain Silo to the north. The main entrance to the Hotel is accessed from the Boulevard. 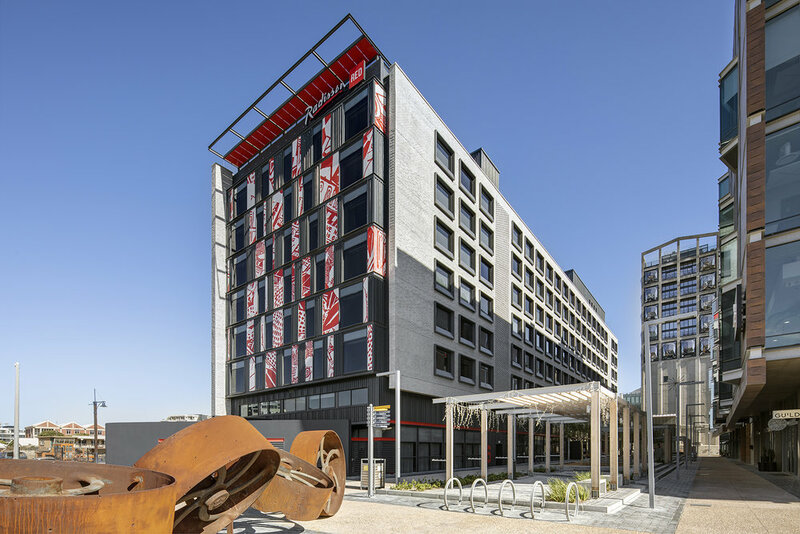 The design of the Radisson Red Hotel, seeks to articulate an ‘industrial warehouse’ character and a robust architecture in response to the ‘semi-industrial warehouse setting’ which is presented by the historic Grain Silos, the Shipyard building activities and the Synchro-Lift environment, while capturing the design ethos associated with the Radisson Red brand. The design brief is represented by a funky, energetic, contemporary aesthetic, combining art, music and fashion with a local/African flavour both in the interiors and the exterior. The renowned artist Cameron Platter was appointed to provide artworks and graphics for the project. One of key design considerations was to articulate the vibrant interior design by the Glasgow based firm, GRAVEN from Scotland, who collaborated with the local Interior design firm SOURCE for the interior design. 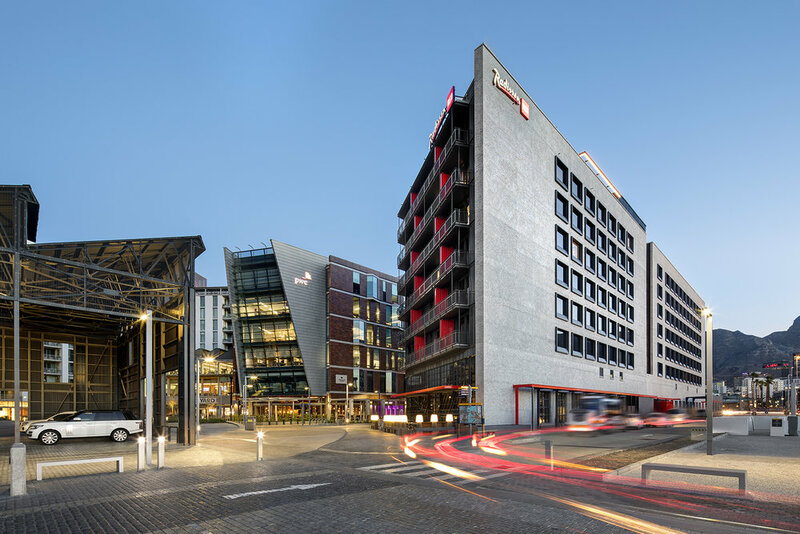 The design process, which allowed for a creative interpretation of these design characteristics, resulted in the conceptualisation of a cutting edge hotel building as envisaged for Radisson Red. The dialogue between the semi industrial harbour precinct and the refurbished Grain Silo building is expressed through the contrast between a robust brick, industrial and modern aesthetic with metal components, combined with glass and metal sheeting cladding, to create a container type design feel which is characteristic of the harbour environment. The overall material combination of high quality fair faced concrete, with high-performance but reject face brick for the building envelope, conveys a ‘contemporary, weathered aesthetic’ which corresponds to the robust character of the Silo District and the Semi-industrial shipbuilding environment, while generous glazed façade elements combined with metal works, seek to introduce transparency to expose and showcase the beauty of concrete as a building material. Because of the existing super-basement condition, the structural design for the Radisson Red Hotel did not quite align with the existing basement structure. The transfer of loads from the upper structures and walls of the hotel is transmitted via ‘V-columns’ which are located above the parking garage columns. The loads were calculated by the structural engineers and the design of the hotel was executed around the structure of the concrete columns in close collaboration with the structural engineers, ARUP.